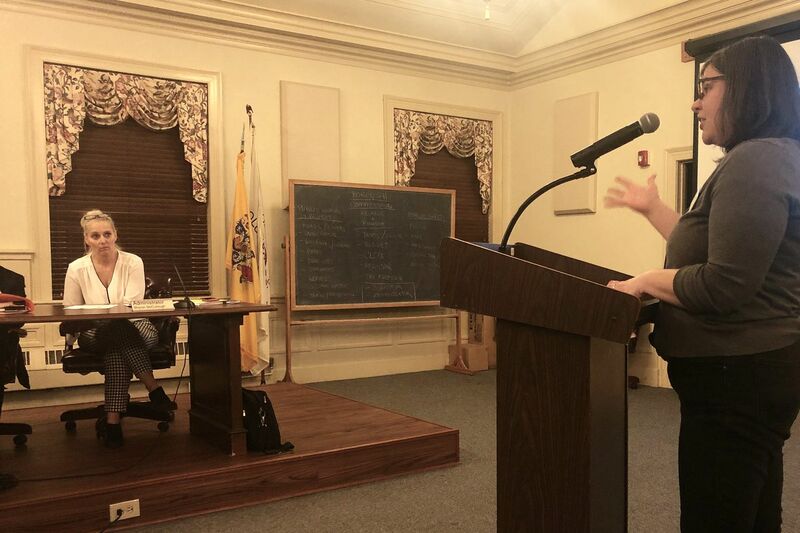 Katie Ingersoll, representing South Jersey Women for Progressive Change, commends Haddonfield's mayor and commission Tuesday for approving an agreement to boost the number of affordable housing units in the borough. Before approving a tenfold increase in Haddonfield’s supply of affordable housing — from four to 42 units — Mayor Neal Rochford and the two other members of the borough commission offered a few words. “I think this is ... achievable,” said the mayor. “Very reasonable,” Commissioner John Moscatelli said. With that, Haddonfield’s governing body on Tuesday concluded a 15-year struggle, including court-ordered negotiations, and voted 3-0 to approve a legally binding settlement with the Fair Share Housing Center. The agreement will dramatically increase the affordable-housing opportunities in a stylishly quaint town of leafy streets, well-tended homes, and well-regarded schools. “Haddonfield is one of the most iconic communities in South Jersey,” said Fair Share spokesperson Anthony Campisi. But if the words from the dais at Tuesday’s commission meeting were about acceptance, if not resignation, there were notes of jubilation among the affordable-housing advocates I spoke to earlier in the day. And it’s worth noting that the commission tabled a related and even more contentious issue — the financial agreement involving the redevelopment of the former Bancroft school property — until April 30. As part of the Fair Share settlement, the Bancroft site on East Kings Highway would include 10 affordable townhouses for moderate-, lower-, and low-income families and individuals. An additional 28 similarly affordable apartments would be built behind the borough hall in the heart of downtown. “What this does is give the opportunity for lower-income families, including families living in Camden, to access, if they choose, one of the highest opportunity places in New Jersey,” Kevin Walsh, counsel to the Fair Share Housing Center, said. He also said the agreement with Haddonfield embodies what the Mount Laurel doctrine emerging from successive New Jersey court decisions since 1975 “is, in its purest form, all about”— enabling economically, historically, and intentionally excluded people to have the same housing opportunities available to others. “Fair housing is a key issue for us,” said Katie Ingersoll, a Collingswood resident active with South Jersey Women for Progressive Change, who congratulated the commission for its vote. The organization, founded days after the 2016 presidential election, has thousands of followers on its Facebook page. “We believe it is a moral imperative for Haddonfield and other towns like it in the region to take positive, aggressive action,” Ingersoll said. Several Haddonfield residents at the meeting also had positive things to say about the agreement. Among them was Chris Maynes, who nevertheless also said the settlement may “make it more difficult” to amend plans for the townhouse complex proposed by Bancroft developer Brian O’Neill, who initially sought to build an addiction treatment center on the property. Maynes, a fierce opponent of the now-defunct rehab plan, said the developer ought to shift the mix among the 80 proposed units toward a greater number of smaller, less expensive townhouses attractive to seniors, and reduce the number of larger ones appealing to families. “I’m sure we could work that out and still honor [the] agreement,” said Moscatelli. The Bancroft site has been eyed for years as an ideal spot to build an age-targeted or age-restricted development where empty nesters and other seniors — especially those in the borough — could continue to live. Others continue to be troubled by the likelihood that developments with larger units, conventional as well as affordable, will generate higher school enrollments. The district is often described as near or at capacity, and the borough school board’s opposition to one aspect of the proposed Bancroft plan is one reason the measure was tabled. The board issued a statement Feb. 28 criticizing a proposed a payment in lieu of taxes (PILOT) arrangement for the developer. Unlike conventional property taxes, a PILOT enables a municipality and county to split the annual payment, rather than also sharing it with the school district. The PILOT would mean that residents of the Bancroft development “will not be contributing [money] to our school district’s needs for 30 years,” the statement said. The borough also needs to bear in mind that "the fourth round [of Fair Share obligations] will begin in 2025,” said borough administrator Sharon McCullough.